David Cameron, British Tory Prime Minister, in a speech to mark the 400th anniversary of the King James Bible, said, “Britain is a Christian country and we should not be afraid to say so”, thereby proving that he either hasn’t a clue about what Britain is like outside his own narrow circle of rich boys, or he is trying to get Britain to go the way of the US, trying to foment sectarian squabbling to detract attention from the greed of his own class and the incompetence of his own government. Lecturing Church of England clergy in Oxford, he claimed that Britain is in a “moral collapse” requiring a “return to Christian values” and condemned “passive tolerance” of immoral behaviour, in, for example, the summer riots, Islamic extremism, City excess and Westminster scandals. Well the balance here is admirably fair, but what about his own response. He’s been the ruler of the UK for the last two years, and, even if his knowledge of working people’s lives is negligible, he ought to have the knowledge and the power to sort out his own lot, the banking and financial sectors and the feeble opportunists who become MPs these days for their own aggrandizement and not through any idea of community service. Cameron argues that the King James translation of the Bible is responsible for much of the English we have used in the last 400 years, something that few would disagree with, although its influence was forced home through periods of intense Protestant sectarianism, and the witch hunts, leaving people with little choice but to toe the line and be devout little Calvinists, Anglicans or Methodists, or suffer unpleasant consequences. Besides that, he thinks our politics have been steeped in the bible too. Well certainly all that Protestant intoleration and indoctrination shaped the growth of capitalism, and the British Parliamentary system, but it takes quite a bit of one-eyedness to see how this springs from the teaching of Christ—it being almost diametrically opposite to his teaching—although material wealth, and by implication greed, is deemed as God given in the Jewish religion from which Christianity emerged. Even so, rich Jews had a sacred duty to leave something for the poor. But those like Philip Green, the chain store owner—along with his wife who lives in the tax haven of Monaco, accumulators of around £4 billion—considers his duty to be to evade the payment of around £200 million a year to the British exchequer. And is Cameron’s fondness for invading Arab countries anything to do with morality, or just greed driven opportunism like that of his predecessor, Tony Blair? Cameron pleads that he is not attacking members of other religions—and none—by claiming Britain is a Christian country, but merely that “the Bible has helped to give Britain a set of values and morals which make Britain what it is today”. It would take a clever man to be able to say which parts of the bible have had the dominant effect on anyone’s morals in the last 400 years. The Christian bible, supposedly centred on the person of Christ, considered by Christians to have been God incarnate, teaches that the poor are blessed and the rich have as much chance as a camel getting through the eye of a needle of entering into God’s presence. Instead they have always taught the same pseudo-mystery as the ancient dying and rising gods like Adonis and Attis—merely by dying and rising up again, we are saved from future death, just as the world renovates itself from death every year. So Pauline Christianity requires no morals at all. Salvation is assured by faith in the myth. Christ required Christians to be moral. He explicitly tells the rich that they cannot remain rich and be saved. The whole purpose of Christian life is service of other people. That is what we should all do—it is the purpose of society—and not waste our talents on exploiting those who are less fortunate and less talented than us, for personal gain. It is something that Cameron, if he chose, could give a lead on. Ha! That is not the morality he means. He is coming from the Old Testament , the Jewish scriptures, which demanded obedience of the law. That is Christianity to him, and it is selectively applied—it applies to poor jobless rioters, but not to bloated financiers who do nothing useful but electronically shipping junk bonds hither and thither, getting bonuses for every pointless criminal transaction. Whether you look at the riots last summer, the financial crash and the expenses scandal, or the ongoing terrorist threat from Islamist extremists around the world, one thing is clear—moral neutrality or passive tolerance just isn’t going to cut it anymore. The absence of any real accountability, or moral code, allowed some bankers and politicians to behave with scant regard for the rest of society. And when it comes to fighting violent extremism, the almost fearful passive tolerance of religious extremism that has allowed segregated communities to behave in ways that run completely counter to our values has not contained that extremism but allowed it to grow and prosper. At first glance, it looks deceptively fair, but again, the buck stops with him—he is the one to whom everyone is accountable in a modern secular society. He as leader of the Queen’s government has had the authority to act where his newly promoted moral stance could have an obvious effect, in the city of London, and in taxing the rich proportionately to their wealth so that “we are indeed all in it together” as leaders like him keep chanting, and redistributing the money in this manner in the tried and tested way—by stimulating the base of the economy, creating jobs in essential public works as J M Keynes showed. If his audience are to be willing to distinguish right from wrong, then he should show them that he can, by rectifying the imbalance of wealth in the country. He has no intention of doing any such thing. While showboating about not agreeing with the Euro Zone countries, he continues supporting city bankers and his own bloated capitalist interests, glorying in the praise of the media barons whose sole purpose is to confuse and indoctrinate the ordinary person. Needless to say, despite his new found interest in the value of Christianity to Britain, he was less insistent about its place in his personal life. He admitted to the flock of CofE shepherds he was a “committed but vaguely practising Church of England Christian” who, while he would stand up for the values and principles of his faith, was “full of doubts and, like many, constantly grappling with the difficult questions when it comes to some of the big theological issues”. He means that he is not going to accept the codswallop of heaven and hell, and therefore has no worries about his failure to practice what the incarnated Christian God taught, except vaguely, of course. Having abrogated the law of Moses as an hindrance to conversion of gentiles to the new universal Judaism of Christianity, the bishops quickly had to impose a plethora of new rules to keep their burgeoning congregations in order. The converts had to remain “in communion” with the church, and so partaking of the Eucharist was obligatory. From very early in gentile Christianity, the new Christians had to bring their children into the church for the holy communion of the Eucharist—even infants! The administration of the Eucharist to children continued in France, according to Bingham’s Antiquities of the Christian Church , until the twelfth century. Adults were required to receive it every day, though it declined to four times a week in some churches and then declined continually until the Middle Ages, when so many churches were empty that Christians were ordered to take communion at least once a year. The early pressure to take the Eucharist was compelling because clergy taught that it was essential to eternal life. It was held in great reverence, and the bishops had complete power over who would receive it, giving them immense control over the Christian slaves of God. Worshippers were not allowed to approach the Eucharistic table unless suitably physically and morally pure and expiated of sin by penance. Again, the bishops had absolute authority over the magnitude of the sin and its punishment. Examples were prolonged absence from church, unchastity, prostitution, adultery, becoming a gladiator or actor, betrayal of Christians to the authorities, pederasty, homosexuality. Note how many sins were sexual in nature, and had little to do with Christ’s moral concerns. Abstention from sexual activity, a personal choice for Essenes, except for those of the highest orders, was made obligatory for gentile Christians. Because of the presumed imminence of the End, Jesus, John and their successors, had had to initiate many who came to them hoping to join God’s coming Kingdom without any detailed teaching of Essene practices. The later bishops, especially the gentiles ones misled by Paul, imagined the celibacy of the senior Essenes had to be followed by everyone. The punishment varied according to the seriousness of the sin, as judged by the bishop. A short period of withdrawal from the Eucharist was the minimum. As the bishop judged the sin as more and more serious, the period of denial of the Eucharist increased to years and then up to the sinner’s whole life! There was worse! The sin could merit denial of the communion for the whole of eternity—excommunication. These punishments seem to have derived from the punishments of the Essene sectaries. Moreover, during the period of penance, when the Eucharist was denied to the errant Christian, the penitent was obliged to abstain from all sexual relationships, even with their spouse, and, indeed, any other pleasure. Every spare minute was to be spent doing religious exercises. At the end of the period of penance, the sinner had to appear before the congregation dressed in sackcloth, with a shaven head, and covered in ashes. They had to fall in submission, like a Moslem, before the bishop, openly confess their sins and publicly beg for absolution. Excommunication meant denial of all Christian sacraments, and the severance of all communication with any Christian—exactly what the errant Essene had to suffer. For them it meant death, for they had to eat grass, as they could not accept any unsanctified food such as that offered by anyone not in the order. The control exercised by the bishops over their flocks amounted to religious terrorism and despotism. Bishops could permit or deny what Christians were led to believe were rites essential to their salvation. It certainly impressed upon Christian converts the enormity of the consequences of being immoral—the conviction that eternal retribution would follow—but few of the sins had anything to do with what Christ taught as reasons for damnation, like failing to love others, or hoarding wealth. And it granted to certain men, the clergy, who were in general no less sinners than other human beings, a fascistic authority that led the Church itself into gross sins and unforgiveable crimes. So Quite How Did Universal Love Become Murderous Vengeance? Our morals at core are instinctive, evolved because we are social animals and so living in groups must offer advantages over living separately as solitary animals. The benefits of living socially are that we can defend each other, care for each other, feed each other, and comfort each other, some of the characteristics Jews call hesed or “lovingkindness”, and Christ called “love”. Journalists and sentimentalists are fond of referring to “our loved ones” meaning people special to us, but proving that Christianity has not penetrated into our souls. “Our loved ones”, Christ taught are all of our neighbors wherever they might be, for any one of them could literally move in next door tomorrow—even some of our enemies! One of the great advantages of Christianity over most Pagan religions and philosophies is that it has a clear role model for ordinary people in that it relates not only some of Christ’s teaching, but also described how he lived and thought. In the days when people were illiterate or were excluded from reading the life of Christ in the New Testament for themselves, stories of the life of Christ as a role model for them to copy in their own lives was particularly important. Believers were expected to be Christs, to behave like Christ. Only the Cathars kept it up, and the Catholic Church ordered a crusade against them, and scattered them far and wide. There was no need of any particular understanding of theology or philosophy in everyday living so long as simple folk had a model of excellence before them. It was easier than it was for, say, the Stoic who was expected always to act sensibly—which is to say with reason—explaining why Stoicism remained the preserve of literate and wealthy people in classical times. It was easier than it was for the Platonist who had to look to God Himself. One of the failings of Christianity was that a majority of Christians wanted to raise up Christ to the Godhead, removing him as a realistic human role model for many. Paul exacerbated this deification by making Christ the object of Christian worship as a risen god on the eastern mystery model, though he was more useful as a human role model, with God left sitting aloft on his unattainable seat of power and judgement. Stoics missed a human role model to such an extent that they inclined to idealize philosophers in that role. Epictetus, the Stoic ex-slave who was a near contemporary of Christ, urged his disciples to choose a role model and to imagine he was always beside them to instruct and guide them in the ways of excellence. Christians, in Jesus Christ, had this model of excellence ready made inasmuch as he was a man of exceptional morality. Not only that, he was, as the propounder of love of others as the key to proper morality and sociality, the object of deep affection. Christians were to love God and to love other human beings, just as they loved Christ first as a symbol of human excellence, and then as an aspect of God Himself. To love others as if each of them were God Himself was Christ’s central tenet, though later Christian leaders decided it was something they would rather not know. It was much easier to get gentile recruits who were simply required to have faith! Most therefore came to prefer just to love God while continuing to hate other humans except for the narrow circle of “loved ones” that most of us love without any effort at all. It seemed to meet Christ’s requirement sufficiently well, they mutually agreed. Having the loving Christ notionally at ones shoulder, like the eminent person of the Stoics, is still the belief of many a Christian. Christ is their buddy, but few of them know him at all well. The image of him they carry with them is not the Christ of the gospels. The role model of the modern US Christian is a Rambo Christ or a type of Dirty Harry. Yet no reading of the New Testament gospels can yield anything like any such image. Christ as a brutal avenger is an atavistic decline from an advanced to a primitive morality, from mutual concern and universal service to reactive tribal vengeance for some dishonor, imagined or otherwise. It has been seen with pelucid clarity in the assassination of Osama Bin Laden, a wicked man, certainly, but no more so than many of our own tribal heroes, no more so than Bush, Blair, Clinton or even Obama. We have lost the ability, essential for compassion, of being able to imagine ourselves in someone else’s shoes. Christians, to follow the lead and tenets of the gospel Christ, ought not to gloat over human death, or to glorify it, yet that is what they do, even the most pious—they claim—of them. Society, which is the origin of the concept of God, has the right to protect itself from those who work to destroy it, but it should do it reluctantly and with sorrow not joy. Joy is for the lost sheep found, for the returning wanderer, not for finding and killing the wayward sheep or wanderer for causing those at home too much worry. Society justly protects itself by due process of law, not by taking arbitrary revenge, and, when all that is left for society to do is to take a life in defense of itself, any human being and especially anyone who professes to be guided by Christ must make every effort to demonstrate the value and efficacy of human morality, which, when universally practised, would abolish the need for punishment. Christians have been ready to castigate Islam as lacking tenderness, despite its pure monotheism and high general morality, because it lacked a suitable role model. For all the Moslem talk about their brotherhood, that was not their central principle—that was their universal submission to God. Curiously, modern Christianity has grown in the same direction. What was meant to be universal, and once was so regarded, is now so narrow that it applies only to “our loved ones”, with no love extended to enemies, nowadays innocent people thousands of miles away being bombed, shelled and machine gunned by our heroes, professional terminators armed to the teeth, and drone killing machines remotely piloted from some distant aircraft carrier. Arabs were not averse to spreading their new imperial religion, Islam, by conquest, by coercion and by taxation (exempting Moslems and converts from it), rather than by love and example. Even so, the Christian world had been in turmoil for centuries, and Persia was decadent, so by keeping order in their conquered territories the Caliphs were preferred by their subjects to their predecessors. Today’s nominally Christian western powers, led by the USA, have no compunction in murdering foreigners on an industrial scale by indiscriminate use of WMD, scarcely even for revenge, but often simply as a warning and an example to the survivors and onlookers. They now know just what to expect when they fail to submit to the will of the all powerful financial and military class of the US. There is no justice in it. The attacks on Iraq and Afghanistan were nominally in revenge for the deaths of 3000 innocent office workers in the Twin Towers, yet the US and its ally, Israel, had conspired to rob a whole nation of its homeland of several thousand years, the very people of whom Christ was a member 2000 years ago, the Palestinians. The UK and US had spent much of the Clinton administration bombing Iraq under the pretence of a “no fy zone” and a stiff regime of sanctions, even before Bush engineered the invasion of 2003. An unknown number, but at least a million, innocents died in the two operations combined. These mega murders were to avenge nothing. They were directed at one man, a man protected for decades by the not at all worthy Christian leaders of a supposedly Christian nation. The mass murder was to demonstrate western, primarily US, power, the US allies in these “coalitions” being simply to dilute the responsibility for unspeakable crimes against humanity by the USA alone. And already in earlier times the US had killed an estimated 2 million Vietnamese by the most horrifying carpet bombing and the use of chemical weapons that are killing and deforming Vietnamese babies still. Just what is Christian in this, only partial, litany of mass murder of innocent human beings? Millions have been killed to show that the US was not to be meddled with, or to avenge much lesser crimes albeit serious ones themselves. Isn’t the point of Christ’s passion and death the lesson that taking human life must always be wrong? Christians consider that Christ was God, and pious Jews approved of his murder. If Christ were to return, he would have a good chance of being klilled at the instigation of some US Christian leader. God is everyman, according to the one Christians recognize as having the authority of His Son, one of the Trinity. When a slight to anyone is a slight to God Himself, as Christ taught, the leaders of the USA are carrying a burden of sin that far exceeds that of its well publicised enemies, those so wicked that they constitute an “evil empire”. If the wickedness of a nation is to be measured by the number of innocent people it has killed then the USA is up with Hitler’s Germany, Stalin’s Russia, and Polpot’s Cambodia—millions! The failure of successive Christian leaders of the USA to recognize the enormity of their own crimes, and their responsibility for them, and the grotesqueness of their boasted claims to moral propriety is an insult to the intelligence of anyone normal, but not, it seems many Christians. The fact that they nearly all remain mute in the face of these horrors shows that Christianity is dead in the modern world. Is it any wonder that the Christian nations throughout history have been so monstrously callous, aggressive and warlike—even though Christ was, according to the gospels, not at all aggressive, rejecting swords, refusing to retaliate and rebuking a disciple who did—when the teaching of the man Christians believe to be God Himself are distorted into their opposite. S Paul is considered by most Christians to be the author of Ephesians , and we read at Ephesians 6:11 that we must “put on the whole armour of God”. Now, in defence of Paul, even a non-Christian can see that this is a metaphor not to be taken literally, but the trouble is that Christian priests and pastors are only too ready to let their flocks of Christian sheep believe otherwise. I’ve cringed to see children’s Sunday school classes take this passage quite literally by having children cut out kid sized paper swords, shields, breastplates and boots of military apparel. They then decorate the cutouts with crayons and tape the pieces to their pint-sized bodies while singing songs about “marching in the infantry, riding in the cavalry, shooting the artillery” and shouting the chorus, “’cause I’m in the Lord’s army”. The nonviolent message that Jesus taught about resisting social and political oppression became the battle cry for just the opposite. This Methodist minister is right to maintain that modern Christians have in general lost the metaphorical aspect of this passage and similar passages, so the girding on of swords and armour ought not translate today into indiscriminate use of “AK-47 assault rifles, explosive tennis shoes or smart bombs”. The armour is spiritual armour, as the passage makes utterly clear, and the battle is a spiritual battle, not a material one. Unfortunately the metaphor is all the more confused because Paul was here being at his most Gnostic, and Christians early on rejected Gnosticism as a heresy. It was, though, already too late to reject Paul whose distortions of Christ’s message filled much of the New Testament . Paul speaks of “the rulers of the darkness of this world”, as the King James’s Version has it, making it sound as if Christians have a duty to take out the evil living rulers of this world in Christ’s name! Yet, in the very same verse, the sense is repeated as “spiritual wickedness in heavenly places”. The confusion is that the belief understood here is that the ruler of this world is the Devil Himself, not God, so the rulers of the darkness of this world are the Devil and his attendant demons. John 14:30 refers to “the prince of this world”, and the temptation of Christ suggests the same when the Devil offers Christ all the kingdoms of the world, but he refuses the offer ( Mt 4:8-9). Gnostic duality existed at the very root of Christianity, but Christians should have nothing to do with it, if the early tradition is to be accepted. Zoroastrianism was clearer. Anyone had responsibility for one spiritual fight only—one’s own. It was your own personal fight to preserve your life against wickedness. If everyone won that single battle, the world would be good. Nevertheless, the same is true of Christianity, for it derived much of its teaching from the Zoroastrianism that preceded it. To presume you are God and make judgements on others meant you had lost your personal war against wickedness—it was the sin of hubris, pride. Christians have to be humble, and humility is not swanning around claiming to be already saved, when that is another judgement to be made by God. The Christian is not allowed to correct faults in others until he has corrected his own faults—they must not try to remove a mote from a neighbor’s eye when they have a plank in their own. In short, how can they pick out tiny faults in other people when they cannot see clearly through the huge faults they have themselves? To think otherwise is hubris. Nor must Christians judge—for the same reason: “The one among you without sin, let him cast the first stone”. Judgement is God’s job, and if anyone should judge others adversely, then God will judge them adversely. It all cautions Christians that their battle is a personal one, and that is hard enough for anyone to have to concentrate upon without imagining that they can tell others what they ought to do. All of this is what Christians should believe, because the teaching of the Christian God is a clear and easily comprehended morality that even a child can follow. Even an atheist can follow it! Why then cannot Christians? It is what is necessary for society to thrive, and has evolved as a moral instinct for that reason. Jeremiah said the covenant of God was to be written in anyone’s heart—it is inborn into all of us that are fully human, and when we try we can feel it there. Why then are so many Christians apparently not fully human? And not just Christians. It is because they have allowed their clergy, their priests and pastors, to dictate for their own benefit and that of imperialistic churches, what morality is, rather than encouraging them to use their instinct. To teach that morality means sexual abstinence is absurd. That is a simple choice. To accept and even endorse that one man should seek to put down or exploit another as capitalism requires is against Christian teaching because it is counter instinctual. To promote greed as a human virtue suits the capitalist but ought not to suit any Christian. Christ favored the poor! A healthy society requires us to rely on—and therefore trust—the honesty, goodwill and empathy of our neighbors. Christ called it love! Fear of death has long been considered a basic reason why people choose irrationally to believe in God rather than face up to the reality of mortality. God will save Christians from death merely because they are Christians, or so many of them believe, following S Paul’s distortions of Jewish Christianity. Even so, most are not so convinced of the certainty of the afterlife to want to test it personally ahead of their alloted time, and anxiety about it remains. Attendance at church and mass seems to increase once people are old and conscious of their impending death. Researchers, University of British Columbia psychology professor, Jessica Tracy, Union College (Schenectady, NY) psychology professor, Joshua Hart, and UBC psychology PhD student Jason Martens, have now shown that people support theories of intelligent design and reject evolutionary theory because of their anxiety about death. The paper is the first to examine the implicit psychological motives that underpin one of the most heated debates in North America. Although so called intelligent design theory is not science, 25 percent of high school biology teachers in the US unconstitutionally spend class time on intelligent design. Most get away with it without reprimand, but very occasionally they are diciplined. Even in Canada, often thought to be sensible by comparison with the USA, Alberta passed a law in 2009 for parents to remove children from courses covering evolution. Our results suggest that when confronted with existential concerns, people respond by searching for a sense of meaning and purpose in life. For many, it appears that evolutionary theory doesn’t offer enough of a compelling answer to deal with these big questions. The researchers carried out five studies with 1,674 US and Canadian participants of different ages and a broad range of educational, socioeconomic and religious backgrounds. In each study, participants were asked to imagine their own death and write about their subsequent thoughts and feelings, or they were assigned to a control condition—imagining dental pain and writing about that. The participants were then asked to read two similarly styled, 174 word excerpts from the writings of Behe and Dawkins, which make no mention of religion or belief, but describe the scientific and empirical support for their respective positions. After going through these steps, participants who imagined their own death showed greater support for intelligent design and greater liking for Behe, or a rejection of evolution theory coupled with disliking for Dawkins, compared to participants in the control condition. These findings suggest that individuals can come to see evolution as a meaningful solution to existential concerns, but may need to be explicitly taught that taking a naturalistic approach to understanding life can be highly meaningful. Natural science students have been taught to view evolutionary theory as compatible with the desire to find a greater sense of meaning in life. Presumably, they already attain a sense of existential meaning from evolution. The researchers say these findings indicate a possible means of encouraging students to accept evolution and reject intelligent design. 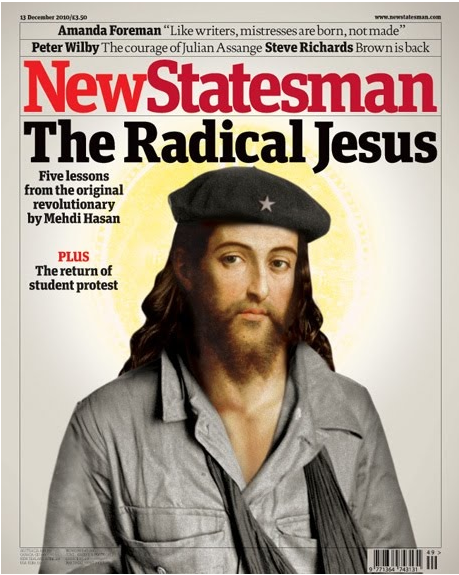 The New Statesman has an item which asks, “Was Jesus Christ a lefty?”. Soviet leader, Mikhail Gorbachev, and Venezuelan president, Hugo Chávez, thought he was. The article even cites the right wing Daily Mail journalist, Quentin Letts, as admitting that “Jesus preached fairness—you could almost call him a lefty”. The author cites several bits of evidence that any Christian ought to be able to recognize. Christ in his earthly incarnation makes it clear according to the synoptic gospels particularly that the poor were blessed and the rich would have a hard time to get into heaven unless they gave their wealth to the poor. In short, salvation of the Christian’s soul depended on them being poor or giving their wealth to the poor to alleviate their poverty and suffering. It is called by modern politicians redistribution of wealth, and is central to socialist policies from communists to social democrats, albeit with different levels of determination. Today, it is meant to be achieved by progressive personal taxation, but conservatives, rich and poor call it the “politics of envy”, and the control of the media by the mega rich like Rupert Murdock ensure that plenty of poor people unable to think for themselves agree. By the same token, anyone intelligent enough to comprehend current affairs knows that the bankers have organized a coup to rob the treasuries of the leading capitalist countries to redistribute the wealth of these rich nations grossly in the opposite direction—from the poor to the rich. Consequently, people are increasingly showing their anger as they slowly catch on to the reality. They are beginning to riot in the streets, throw bricks through the windows of rich bankers and their political puppets, and will doubtless begin to clear out the bankers when they feel strong enough to do it. Isn’t this just what Jesus did when he took a whip to scourge the money changers dealing in the temple forecourts? The question is rhetorical. The answer is that it is indeed what he did! The president of the USA, Barack Obama, tried to get a rudimentary bill accepted to allow health care for the poor. He succeeded but the child is itself sick. The UK has a successful National health Service and has enjoyed it for over fifty years, but neoconservative governments under Thatcher, Blair, Brown and now Cameron have deliberately chopped and changed its funding and organization so that it is gradually sinking into despair and helplessness. The modern right wing is utterly opposed to health care for the poor and sick unless they are willing to sell everything they have to the predatory rich to finance it. What of Jesus? He is remembered as much as anything for his acts of healing, freely healing the blind the deaf, the lame, the mute, the mad, and the leprous. He required no payment for it and did not confine it to the rich. Christians are supposed to believe Christ was God incarnate, and so God Himself acted to cure sick people free, gratis and for nothing! No Christian can think poor people devoid of the money to pay a doctor should be left to die, and Jesus had a parable, the Good Samaritan, that showed a despised figure acting as the Christian should, when the supposedly good men had left the wounded stranger for dead. Today, the story would be the Good Communist, to convey its full significance to smug self-saved pharisees. Christ instructed Christians to do the same as he did, to go into each town and “heal the sick who are in it” ( Luke 10:9), not to deny them health and healing unless they had paid fat insurances for half a lifetime. You have heard that it was said, “An eye for an eye and a tooth for a tooth.” But I say to you, Do not resist an evildoer. But if anyone strikes you on the right cheek, turn the other also. The two great Christian leaders had agreed that because some Saudi Moslems had blown up the iconic twin towers in New York, God meant them to kill a million Iraqis in some sort of distorted principle of “an eye for an eye”, while remaining chums with the relatives of the man actually responsible, another Saudi prince. The response to the posting of this perfectly valid item on a right wing blog was as expected—a large right wing and US Christian response! The politest was simply, “Christ, a leftist. I think not.”, and many mimicked Moslem jihadist talk but aimed at the Moslems and the New Statesman . Even the magazine’s editorial pages were reprinted so that the Republican Christian jihadists could wreak their revenge, if they wished. Few thought it worth trying to find some way of rebutting the supposed misrepresentation of their faith. One did claim that what Jesus taught as God incarnated into history was irrelevant because his nature changed completely—from commie to nazi, presumably—when he arose from the dead! Everything then that Christ took the trouble to teach by relinquishing his nature as a God and appearing on earth is totally refuted by his rising as a spirit! Why then did God bother incarnating and suffering? Needless to say, although God Himself appearing on earth, teaching and making speeches was irrelevant, the mere man called Paul who set himself the task, and evidently succeeded, of refuting everything the Christians’ God had done and said, is quoted often in those who did attempt some sort of reply. What is astonishing is that these people believe that they can be disciples of Christ with the rancid views they have. But they have, indeed, since the very beginning of their own religion, found their own God’s actual teaching far too difficult, and they quickly adopted the anti-Christ, Paul, in preference—its much easier to believe that you need not be kind, loving and compassionate to your fellow human beings because Christ has done it all for you, so all you have to do is believe in his body, and Lo! you are saved, by pure magic! So you can carry on being as obnoxious as you like in real life. These poor people make no bones about redefining what Christ said while he lived. They are supposed to think he was God, but happily say it is impossible to be peaceful when evil abounds, and so impossible to do as God taught, thereby utterly rejecting God’s own inerrant word! God on earth is irrelevant but some unstable character is treated for all the world as if he is God instead. They cite descriptions of the apocalypse in Revelation , and are so convinced it cannot apply to them that they pray for it to happen soon! The Jewish tradition of the apocalypse was as the day of God’s vengeance, and the vengeance is against all sinners! But because they ignore what Christ told them in favour of Paul’s blandishments, they cannot see any of it as applying to them. Christ repeatedly explained how hard it was to be sufficiently free of sin to get into heaven—it was by a narrow gate, whereas the gate to hell was broad. His explanation was graphic—your hand is sinning? then cut it off rather than go to hell on its behalf. Yet these smug idiots think their reading is necessarily the right one, even though people on the left, some of whom remain atheists, can read it all prerfectly well themselves, without a Republican Pastor telling them what he want them to think it means. Still, there is no chance they will learn. Their Christ is Satan, and they are so drunk with their faith in him, they cannot see it. Why do Christians Treat Paul as if He were God? I do not profess to be a Christian, but I can read fairly well, and can understand most things I need to. Yet my understanding of Christian belief is that Christ is God incarnate. When Christ speaks, it is God speaking, so Christ’s words are God’s words. Doesn’t that mean they ought to carry particular weight when deciding what Christians should believe? Christians might say that the whole bible is God’s word, so all of it has to be taken into account, but that makes no sense, because it reduces the words, deeds and commandments of Christ to being no more than those of Paul of Tarsus, or anyone else whose words and deeds are reported. Christianity is so called because Christians believe Christ is God, not that Paul is God. Why then do Christians treat Paul as if he were God, and prefer his words over whatever Christ said. Christ was clear about how the Christian was saved, but few Christians bother about that. Instead they follow what Paul said. They are ignoring God and believing Paul who was merely a man. If Christians truly are Christian, then, surely, they must follow what God in the bodily form of Christ told them, and whenever Paul contradicts it, Paul is wrong, not God. Indeed, when Paul contradicts Christ, he is being an Antichristian, not a Christian. Most Christians are actually Antichristians because they follow the Antichrist, Paul, who persuades them that their own God, Christ is wrong.